I’ll make it immediately clear that Philip Seymour Hoffman deserves to win the Best Actor Academy Award for his role in Capote. His work here is the most impressive in an already distinguished career despite his comparative youth; usually offered supporting roles, here he grasps the opportunity to carry a film with both hands and really does walk off with it. His long overdue success comes in a film that, while impressive enough, lacks a certain something – it isn’t that it’s bad, it’s just less than it might have been. I get the feeling most of the problems lie at the script level. Futterman is a first-time writer, and it shows; while the dialogue is economical and sparkling, the pacing is uneven – while years pass in the lives of the characters, it seems like very little to us watching. Also, a film which unfolds at a languid pace should offer considerable detail (of anything) to the viewer, but come the end I felt like I’d missed something. That’s all the bad stuff, though. 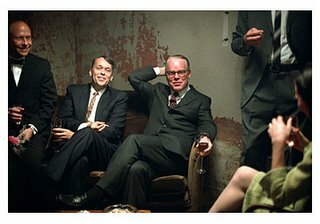 Hoffman is so good that it must be seen to be believed – note particularly how he uses props (cigarettes, glasses of alcohol) and gestures to convey the inner workings of the character, not to mention the mastery of Capote’s unusual voice. It’s a masterclass. The supporting parts are filled out by actors that are always worth watching – Clifton Collins Jr., Catherine Keener, Bruce Greenwood, Chris Cooper – but apart from Collins, we don’t see as much of them as we would like as they get written out of the action. Miller, a first-time director (very much a freshman effort, this film), hints at a potentially glorious career. His compositions frequently reminded me of Brokeback Mountain, a comparison which he himself is not surprised by, because he has studied Ang Lee’s films. There are plenty of worse directors to imitate, that’s for sure. I’ll watch keenly to see what he does next. I did quite enjoy Capote, but as the brevity of this review shows, it hasn’t really stayed with me. While a more focused and less forgettable portrait of a famous person than Walk the Line, it drifts at times, seeming a bit padded despite its relatively short running time. Many critics have lavished great praise on it, so on their opinion and the strength of the acting it is worth seeing, but for this particular viewer I don’t expect it to linger in the mind. I did, however, get to see the trailer for Caché, which threatens to be the greatest film of the year – I really cannot wait.